Patty and I have been enjoying Seattle. We’ve been here for 3 weeks prepping for the JCAR14 trial at SCCA/Hutch. Tomorrow is my big day- I get the CAR-T cells. 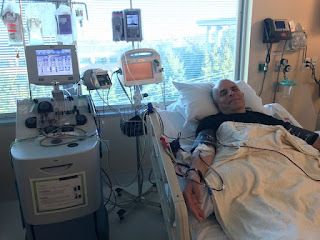 I’ve been blogging on my experience on the CLL Society website http://cllsociety.org and we are adding interviews and research on CAR-T (see: https://cllsociety.org/car-t-and-other-cellular-therapies/) but that may slow down if I am part of the 90% that end up in hospital. Check out our CAR-T educational comic book while you are there on our site. Anyway, I wanted to stay in touch and look forward to continuing the conversations when I am on the far side of this with no evidence of CLL left in my blood, marrow, and nodes. Founder and Medical Director, CLL Society Inc. I had planned to write more often, but long hospital days, followed by long naps and long walks most days have precluded me doing much more than remembering my trial schedule and completing a hurricane of critical paperwork and lengthy CLL Society’s to-do lists while I am still able to work. Despite my sincere intention to be here and now in a more public way, blogging has taken a second seat to more mundane needs. And to my own health priorities like sleep and exercise. But I have clinical studies to share now. Two days ago, I got my results, and the news was mixed. My blood chemistries were all good except for a slightly elevated LDH consistent with a cancer on the move. My blood count showed a continuing slow downward trend in my HGB (today it was 11.9) and a slightly climbing lymphocyte count in the high teens now. Platelets and neutrophils remain within the normal range. Just a few months ago my lymphocyte count was 1 and HBG was 14. My CLL is taking off. Bone marrow biopsy (BMB) was hypercellular at 65% suggesting it has had to expand due to infiltration with leukemic cells. In fact it showed that more than 80% was filed with lymphocytes, leaving less than 20% of the factory floor to make all my red cells, platelets and other white cells. By flow cytometry about half of the white cells were clonal, consistent with CLL. The one surprise was that no 17p or 11q deletion was detected Hard to explain. May be a sampling or technical error, or that a different CLL sub-clone without those deletions has become predominant in my marrow. My last BMB five years ago had normal bone marrow cellularity at 40% and only 20% was lymphocytes. That was on ibrutinib while it was working well. My CT scans last week were filled with” innumerable” enlarged lymph nodes, but at least they were all less than 4 centimeters in their longest diameters. My PET scan showed those nodes to be metabolic active, but the highest SUV was only 4 making Richter’s Transformation (RT) less likely. However, PET scans may be less helpful in predicting RT in those failing novel therapies. For comparison, two and half years ago, I had no enlarged nodes with imaging. Clearly my CLL is on the march in the blood, marrow and nodes and it is time to treat. So here is where Goldilocks comes into play. If one’s CLL “tumor burden” is too high, especially if one has “massive” lymph nodes greater than 5 cm. and certainly greater than 10 cm. there is suggestion that the army of CAR-T cells may have too many enemy combatants to wipe out or they may be too far out of reach, even for these hyped-up serial killers. If one’s tumor burden is too low, there is a chance that the genetically reengineered cells won’t get enough stimulation to expand and will just die off without ever engaging in battle. So there is a sweet spot, Goldilocks’ just right bowl, where the T-cells are stimulated to expand but are not overwhelmed by the amount and depth of the cancer. The way T cells kill is up close and personal. They need to wrap their arms around their targets, and if they can’t get right up against each and every CLL cells in a massive node, the cancer will live on. In fact, published CAR-T responses tend to better in the blood and marrow than in the nodes. My odds of a deep and durable response are excellent based oy my labs and imaging. However, the risk of cytokine release syndrome (CRS) and neurotoxicity may also be correlated with the total amount of disease burden (not so much the size of any one node, but the sum of the diameters of all the nodes), and by that criteria, I have more than enough disease to suggest I will have a wild roller coaster ride ahead of me. Looks like I will need to get worst to get better. Wish it weren’t so but it is what it is. I say bring it on.